We are garden fairies and we are taking over this blog once again because we feel obligated and inclined to comment on recent events regarding the discovery by Carol of the Secret Diary of a Garden Fairy. We garden fairies normally post in the evening, but it is raining this morning so we thought we would come in where it is dry and take over the laptop while Carol is off reading something called Agatha Christie mysteries featuring Miss Jane Marple. Some of the garden fairies of course did not come in out of the rain because they are lying under the goldenrod trying to catch raindrops that drip down from the goldenrod flowers. Such raindrops, when they drip off a goldenrod flower, have restorative properties. We garden fairies have waited quite some time for this rain, while there are still some blooms on the goldenrod, so it is not to be missed. Restorative properties, you ask? Oh, we are garden fairies and we can see your minds spinning. The next thing you will ask is why don't you put some tubs under the goldenrod to catch the drops of rain coming off the goldenrod flowers and then bottle them and sell them if they have restorative properties. We are garden fairies and we will tell you why would never put some tubs under the goldenrod to catch the drops of rain coming off the goldenrod flowers and then bottle them and sell them for their restorative properties. It is not because we are lazy. Granny Gus McGarden down in the vegetable garden takes great offense to the idea that garden fairies are lazy, by the way, so don't say or even think that in her presence. The reason we would never bottle up the raindrops that drip from the goldenrod flowers is because the raindrops lose all their restorative powers if they touch anything other than a garden fairy's tongue. That is why on rainy mornings when the goldenrod is blooming, if you should care to go out in the rain and see for yourself, you'll find more than a few garden fairies lying beneath the goldenrod with their mouths open, waiting to catch just one restorative raindrop as it drips off the tip of the blooms. Excuse me while I go out to try to see fairies with open mouths. This just might be the way to see them. I need to plant some goldenrod! You have such smart fairies in your garden, and very healthy, too I presume. What a fun blog! I'll watch under the goldenrod after it rains today...It's good to know that goldenrod is a good for fairies, it's also a wonderful plant for pollinators. 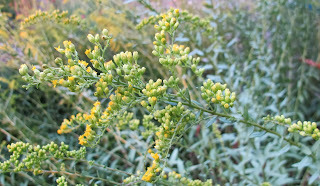 I will have to go out during the next rain and look at my goldenrod. Missed it yesterday!